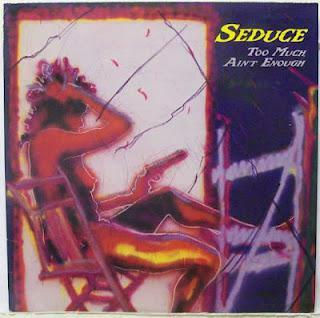 So, continuing the round-up of "glam" metal bands that somehow manage to absolutely rock, here's Detroit's Seduce and their 1988 rock/metal masterpiece Too Much, Ain't Enough. Opener "Anytime or Place," lurches forth with a detuned D riff, reminding you that this is a rare beast: a glam band that prizes the riff over the vocals-- the riffs are in your face while the vocals are more in the background (not that you can't hear them)-- something like early Sabbath or The Sword. "Watchin'," with its sad, social commentary lyrics over a sludgy "Dazed and Confused" riff, again manages to be "hair metally" and yet not... something more (which sadly is probably why Seduce never got much media attention beyond their role in The Decline of Western Civilization Part II, The Metal Years). "No Use," "Been So Long," and probably the best track on here, "Crash Landing," all serve to destroy your faith in an organized universe: they're genuinely awesome songs, but Seduce lost their record deal with IRS records shortly after this was released, and effectively disappeared. How can an organized universe not herald this record?! It should've been re-issued under the subtitle: Instigator of Crises of Faith. Overall, Too Much, Ain't Enough is riffs with hooks: the riffs and song arrangements are something like King Diamond/ Mercyful Fate if they grew up in LA and loved Mötley Crüe and LA Guns rather than the NWOBHM. For better or worse, 20 years later, no one really sounds like these guys. They're a strange, wonderful blend of rock styles. And I'm really not trying to be hipster guy with the obscurity here, but I couldn't find this fucker anywhere on CD (except amazon, and this for nearly $90!) and it's not available on mp3; I actually wrote this review from the cassette I have in my car. If you dig the tunes, pull the audio off some youtube tracks (the whole album is available there); that may be the only way to have a digital copy of this. Swiss Black Metal Pioneers S A M A E L Are Back and Re-release Their Legendary Albums Lvx Mvndi and Solar Soul.